Solar energy remains tantalizingly out of reach as a widely used power source, but a UNL engineer is making big strides in his quest to harness the sun. He’s attacking that goal on several fronts with grants of more than $1.2 million from the U.S. Department of Energy and $2.6 million from the National Science Foundation. Perovskites, a class of abundant crystalline compounds, are a promising solar cell material that potentially could cost a thousand times less than silicon, Huang said. His evolving techniques are helping to set records in perovskite solar energy efficiency. Thanks to his and others’ advances, the material now rivals silicon’s 20 percent energy efficiency and promises greater improvements. Our target is to reduce solar cell costs by half, so it can compete with energy from fossil fuels. 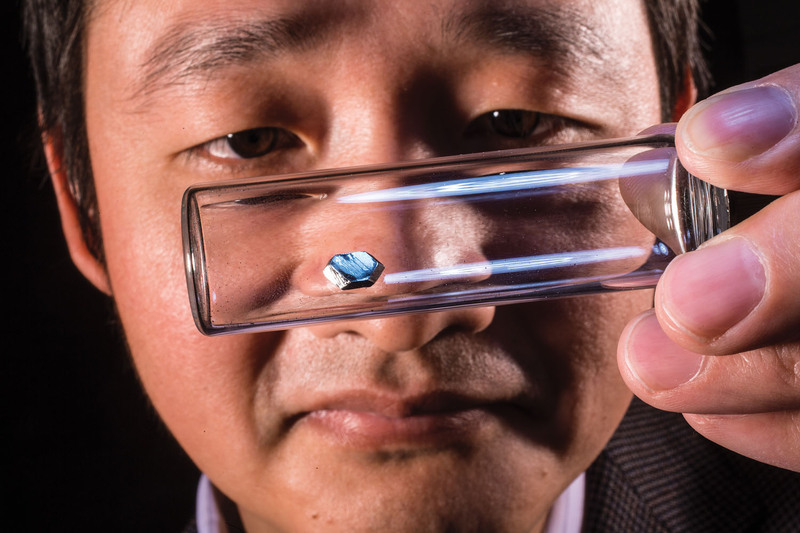 Huang and his team also created a single, large perovskite crystal using a low-cost fabrication technique. They demonstrated the material’s potential capacity as a sun catcher is thousands of times greater than previously reported. Their findings, published in Science, provide insight into future improvements. 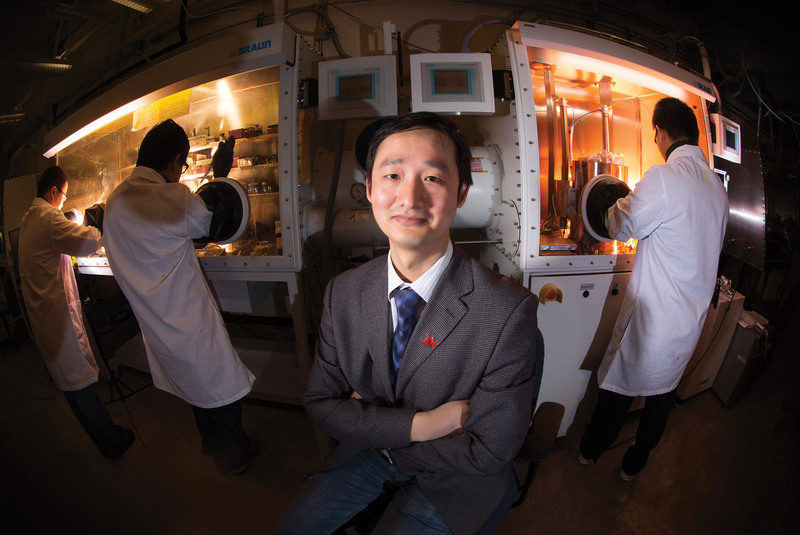 Huang continues to study what makes perovskite crystals so exceptional. He’s also investigating a new fabrication technique to make inexpensive, large-scale solar cells for a variety of applications. 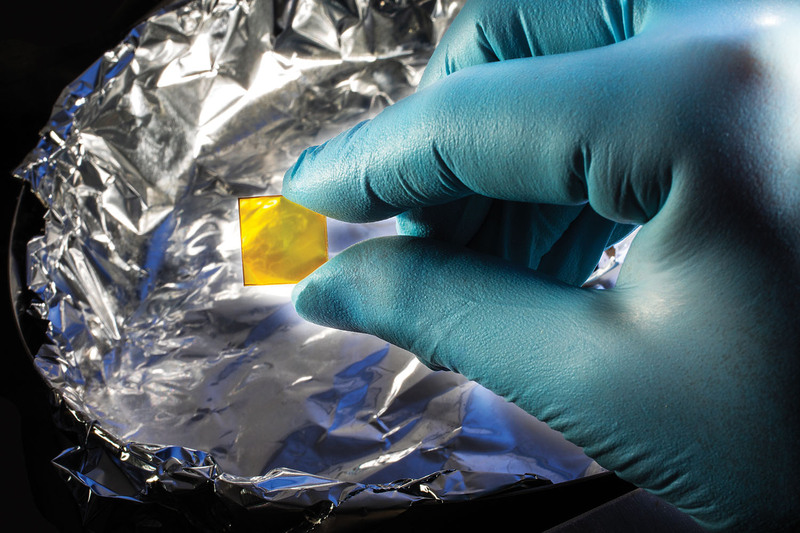 Perovskite degrades easily so more research is needed before it can replace silicon. As an intermediate step and to take advantage of established technology, Huang is investigating ways to overlay silicon with an ultrathin film of perovskite to increase current solar cell efficiency. Another major solar cell avenue replaces silicon with less expensive organic polymers, or plastics, which are cheaper and more flexible, but also less energy efficient. Huang continues exploring ways to improve organic polymer semiconductors. Jinsong Huang inspects a perovskite crystal grown in his UNL lab. The crystal’s properties could greatly improve the electrical devices we use. UNL research shows fabricating an organic solar cell on a nonwetting plastic surface makes it 1.5 times more efficient at turning sunlight into energy.